TheDarkeowl: SPIDERMAN Inspired Makeup Look! Again I started off by applying my primer, foundation, and powder (a post here on my everyday base essentials). I also applied my eye primer which is from E.L.F.. I left the cover on the palette so it made for easy reference. To start, I used the colour 'Mermaids' in the crease and blended it up with a blending brush, so that the darker colours would stay closer to the crease and it would make for an easier blend. I then went in with the colour 'Waves' over the top of 'Mermaids' but I kept it concentrated in the crease, so that the colour was more intense and blended out more smoothly. as intense as I would like. 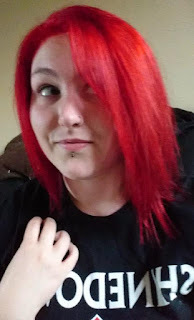 Once I had packed more of the red on, I went back in with 'Waves', as the colour had faded a little. I then used my E.L.F. Crease Brush to add 'Waves' underneath my eye, close to the lash line. I felt that the look needed a little more, so I went in with my blending brush again and added 'Whale' to the outer corner, to give it more of a smokey look and incorporate some more black into the look. I then applied 'Seashell' under my brow and on the inner corner as my highlight. ...I was going to see if I could create a very small web on the corner but I didn't want to risk messing up the whole look! So I kept with 2 flicks on the outer corner! I think it turned out really well and I might try it again in the future. Once that was done I added a few coats of my Collection Volumising Mascara and then the look was finished! (Keep scrolling for the final look and an overload of pictures! So that was my Spiderman inspired makeup look using the Makeup Revolution Mermaids Forever Palette. I really like this look and I've worn it out a few times now! It lasts well throughout the day and isn't too extreme! If you decide to try this out please let me know and show me how it turned out, I'd love to see it! I hope you enjoyed this post, let me know what you think or tell me if there's anything you would like me to try.